Wisconsin has had the oddest weather. In October I complained, and rightfully so, about winter having arrived too early. With three inches of snow decorating the ground on October 12th, I wasn't the only one that thought winter was upon us. Many bird species that spend the summer in Northern WI expedited their migration schedule fleeing the snow and cold temperatures. I must have some "pull" with those that control weather because when November arrived, the temperatures were more like what October should have been. It is confusing for those of us living and working in the "frozen tundra" of Wisconsin. I suspect was getting a mite too comfortable with the warmer than usual November. I lulled myself into thinking that this year gentle temperatures would remain through March, at which time it would become spring again. Last night ended that dream. Now my worry for the birds both wild and in our care begins anew. Darn! 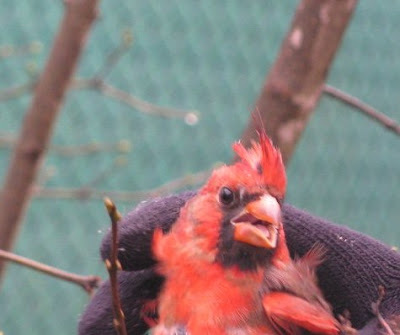 We released the male Northern Cardinal that was admitted about a month ago. He recovered quickly and molted in the feathers he was missing when admitted. The photo shows a rumpled bird. The photo was taken quickly as he was about to make his exit. He was fine but unhappy about being chased and caught up in aviary. He was not sure what was happening but didn't want to participate in the "fun". If only he knew our intentions were to let him go he might have had a smile on his beak. What a different bird he was as he flew off than the day he was admitted lying in a box. People love the beautiful cardinal. They are a bright spot in the winter landscape and are one species that spend the winter in WI. They frequent feeders and keep our otherwise quiet winter world joyful. The Peregrine Falcon is improving. He was injured in August near Poynette and recently developed complications with his nictitating membranes of his left eye not closing well. The surgery of the other day will resolve the problem. He is regaining the peregrine personality now so we know he is feeling better. We are working hard on getting the last newsletter of the year out this upcoming week. There is still some last minute work to be done moving sensitive birds indoors and winterizing outside pens for those that are able to withstand the winter temperatures. 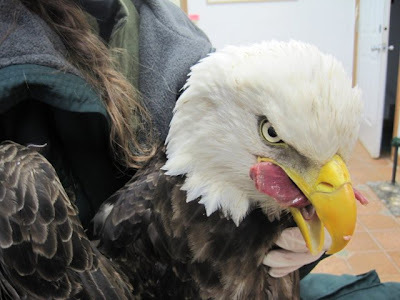 We have three Bald Eagles ready for release. They will be be released this month into a wintering area. That is good news. I will let you know the dates for the releases so those who want to attend can do so and celebrate with us.